Wings Neck Lighthouse is privately owned and managed by the Wing’s Neck Lighthouse Trust. Formerly a US Coast Guard Lighthouse, the property was auctioned in the 1940′s. The light tower still stands attached by a breezeway to a three bedroom keepers home. Located at the tip of Wings Neck Point, in the town Pocasset on Cape Cod, the house has one of the most fabulous views of the Atlantic Ocean ever experienced. Situated literally inches from the water, the rocky slopes are beautiful and traditionally New England. The house was completely renovated in 2003 and is now available for weekly rental year round. Neck Light assumed its real importance for a number of years. The first lighthouse at Wings Neck was a Cape Cod-style lightkeeper’s house with a lantern placed on the roof. In 1889, damage from an earlier fire and general disrepair forced the construction of a new lighthouse. The present keeper’s house, with its attached hexagonal wooden tower, was built to replace the old Cape Cod-style house. For many years, Wings Neck was deemed one of the most important lighthouses on the Atlantic Coast because of the heavy shipping traveling the Cape Cod Canal but, by 1943, newer technology was making the lighthouse obsolete. The property was sold by the government in 1947 to Frank and Irene Flanagan. They loved the property with a passion and enjoyed a long retirement there until Irene passed on in 1999. The property was completely renovated in 2003 and is now available for rent. Keeper’s House Available for Vacation Rental! 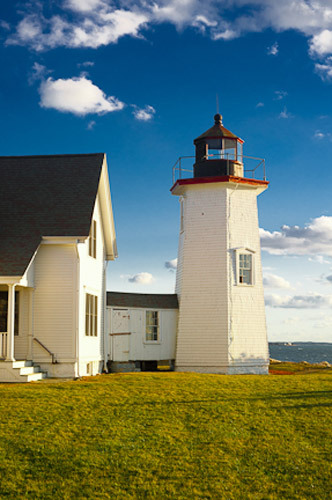 The lighthouse sits at the very tip of Wings Neck in the town of Pocasset and is available for weekly rentals. Visit Wings Neck Light website for more information.